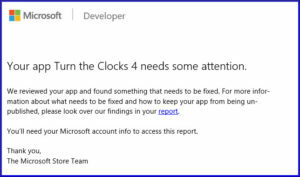 One of the frustrating things about putting a game on the XBox Creator’s platform is when you get the dreaded “Your App Needs Some Attention” email a few days after submitting the game. This is usually due to the requirement that you must display the player’s gamertag on the title screen. There is a UserProfile prefab in the XBox Unity kit that is supposed to do this for you. Unfortunately, there are some issues with it that keeps it from working correctly. For my first XBox Creator’s game called Kitty’s Adventure, I resolved the issue of it not displaying the gamertag by putting the XBox Services loading and sign-in code on it’s own Scene in Unity, and I don’t proceed to the title screen until the UserProfile object exists and the IsSignedIn property is set to true. 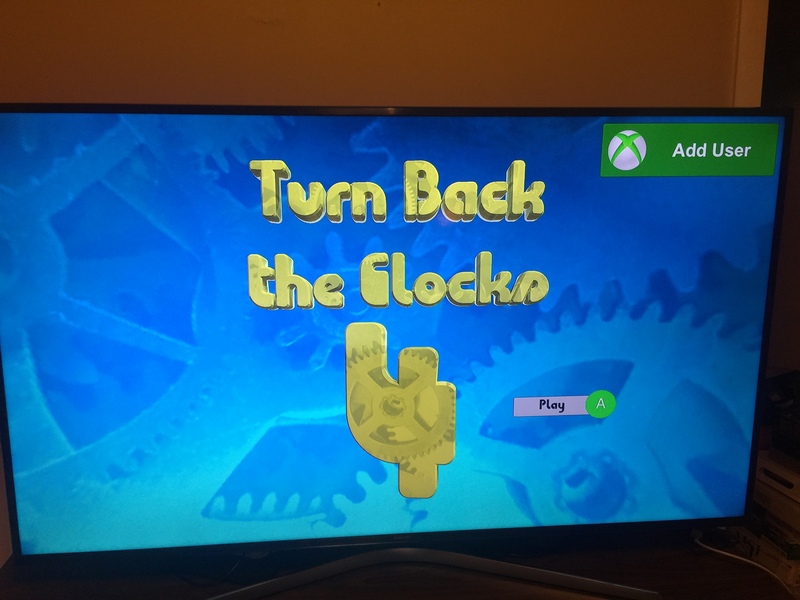 In my Turn Back the Clocks 4 game, I realized that I had an old GameObject in the XBox Services loading scene (was probably a placeholder I forgot about), which just loads the title screen in the Start method. Therefore, the XBoxServices were not given enough time to load. I know that was definitely a problem, and I’m hoping fixing that is enough to get the submission to pass. The certification process is a little confusing as well. 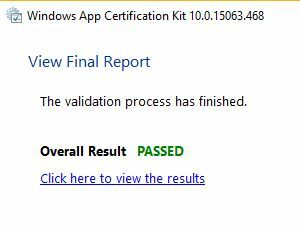 There’s the Certification Tool that runs after you create an appxupload package in Visual Studio. It’s possible to pass everything in the Certification Tool, and still get a failure after you submit the package to the Microsoft Dev Center website, which I think requires to real person at Microsoft to start your game and verify the gamertag. However, it doesn’t seem to be as bad as the Evil Checklist and peer review process that was used for XBox Live Indie Games, which required six or so other developers to play your game, which could take a week or longer. I’m so glad that we no longer have to worry about the “title safe area”, playing from any controller index, or memory card pull tests. It’s a bit confusing, because it says that you game “is in the Store”, but they give you three weeks to fix the problem before the game is unpublished. What “in the Store” means is up to interpretation, because it now says that your game may not appear in the Creators Collection until it is resolved. I think that is a new condition that they added since I published my first Creators game. Also, for my first game, I had one “product” (entry in the Windows Developer console) for the Windows build and a separate one for the XBox One build, but for this game I submitted both the Windows 10 PC and XBox One as one product package. Just having one product is easier to submit, but I think keeping the platform submissions separate makes things more manageable and easier to tell which platform the problem is related. It requires that you manage two separate entries in the Windows Developer dashboard, but it does let you easily see analytics (such as downloads) for each platform. One of the problems that I had with my first XBox Creator’s game was the “XBox Veto” error when running the game with XBox Services integrated on the XBox One console in Dev mode. While I was researching for this game, I discovered that the veto error was due to the sandbox name of the XBox One not matching the name of the sandbox ID that is in the XBox configuration panel in Unity. Once I changed that, I no longer got the XBox Veto error. However, I did get an error about the social object needing a local account, but I only saw that error once and it never happened again. Then I was able to deploy my debug configuration to the XBox One, and now it successfully displays the gamertag and gamerscore of the test account on the title screen. Unfortunately, it doesn’t seem to work when deploying the master config to the XBox One (it just displays the default “<gamertag><gamerscore>”, so I’m not sure if that is the expected result (it only works for the debug config) and it works correctly when it goes live. I spent hours working on this (I didn’t intended to spend my entire vacation working on it) so I went ahead and made another submission to the Windows Developer site, hoping that it passes this time. Looking back, I really wish I had sent more time on the game before putting it on the XBox One platform instead of rushing it out for the Dream Build Play deadline. I still think it’s a really fun game, but it seems like a lot is lacking without leaderboards and some things like the model for the bonus wheels need improvement. Over the Christmas holiday, I’ve been working on wrapping up the Turn Back the Clocks 4 game for my Dream Build Play 2017 entry. The three things that I planned to accomplish were creating more levels, XBox Live integration, and updating the leaderboards. Creating additional levels was my first priority. Fortunately, with my level parser code, making new levels is a trivial task. 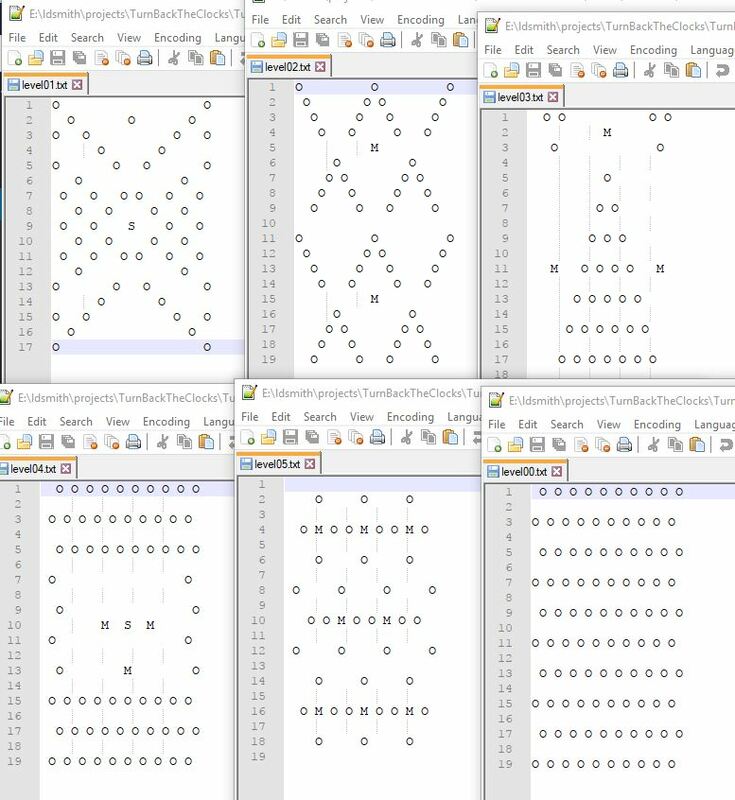 I use a text editor (Notepad++) to lay out all of the clocks, mines, and slot in each level. For the first level, I wanted to just introduce the player to the main objective of the game, which is activating the clocks. So the first level is just filled with clock objects. The other two mechanics in the game are the bonus wheels and mines. I wanted to introduce these to the player each in a separate level. I decided to introduce the bonus wheel in the second level, because I consider it to be a positive stimulus. If you hit the slot target with a ball, then you get the bonus well. Therefore, I introduced the mines in the third level, since it has a negative result. Hit the mine with a ball and it explodes. Using text files to lay out levels has worked really well in my other games. It eliminates the need for a bloated level editor and the levels can be quickly and easily changed. The downside is that there is only so much information that you can store in a single character. However, it works well for games like this where the objects don’t have any additional properties. The one thing that I really considered when making levels was the amount of interactivity between the objects in the level. Some levels I had to rework just because it was possible to shoot a ball to the bottom without it hitting anything. Another problem arose when I would have a bonus slot on the level without anything above it, so that the player just needed to line up the cannon with the slot to get the bonus every time. With a lot of the levels, I had to do a lot of trial and error by playing each one multiple times. I didn’t want the bonus wheels activating all of the time, but I didn’t want it to be so hard that that it was rarely activated. I tried to make it so that the bonus was activated about once each time the level is played. Due to time constraints, I currently have six levels, which feels about right for this competition. I had originally planned to make twenty levels, but I think the player would have a good understanding after six levels. After the competition is over, I would like to go back and add more levels. I wanted to fix the leaderboards in the game, so that the scores were stored on a per level basis. Currently, the game calls a PHP file on my server with the player’s name a score as parameters after each level is completed. To separate the scores by level, I would need to modify the scores table in my MySQL database to add a column to hold the level number. This wouldn’t be too difficult, but I would also need to rework the PHP code to accept level number as a parameter. Also, it appears that I may not be able to send an HTTP request to my server when my game is deployed on the XBox One. I’m guessing the UWP applications may be sandboxes from contacting any external servers. There is a way to store scores for a leaderboard using the Microsoft infrastructure, but I really haven’t gotten a chance to try it yet. If I do eventually use the Microsoft leaderboard services, I would definitely have to consider modifying my code so that I could switch between using my server or Microsoft’s leaderboards. It seems like it should be possible, since I would just need to add an “if” statement in my Leaderboard class to control where the name and score data is sent. The most important change that I needed to make was adding the XBox Live services. Actually, I believe I could submit my game as a Windows 10 desktop app and not integrate XBox Live. However, it is required to publish to the XBox One Creator’s platform. I’ve been through this process before with my first XBox’s Creator’s game, Kitty’s Adventure. The first thing that I do is make sure that the game is playable with an XBox controller. To do this, I had to add additional button mappings in my Unity Input settings. I added virtual buttons for each of the colored buttons (A, B, X, Y). I found this diagram a few months ago, which is a good reference for how each button on the XBox controller maps to each joystick index. 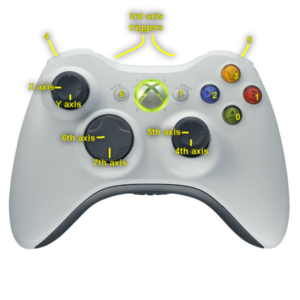 I noticed in the past that when a Unity game is deployed on the XBox One, the UI controls don’t seem to work. So to get around this, I add button icons next to each of the Unity UI buttons, and then write Input handler code, which calls the same method that is executed from the button press action. The rest of the XBox Live integration involves little actual programming. The general steps for XBox Live enabling a Unity game can be found in the Windows Dev Center documentation. 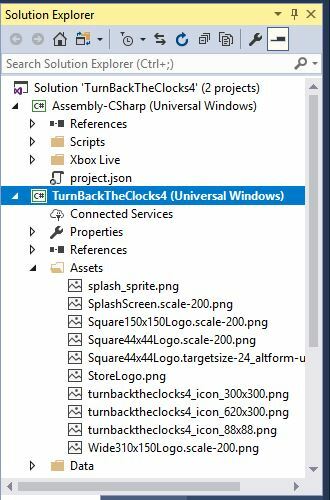 Of course, the build target must be set to UWP, which generates a Visual Studio project. Here are some pitfalls and gotchas that I’ve experienced from this game and my previous game. If you get a message like “failed to process xbox live directorynotfoundexception”, then change the Scripting Backend from IL2CPP to .NET. This should also fix the problem with Unity C# Projects not being selectable on the build window. Before deploying the game in Visual Studio, make sure that Master x64 is selected in the configuration box dropdown. If I remember correctly, if those two settings aren’t selected, your build will fail with the local certification tool. When deploying to XBox One in developer mode, make sure that your XBox is connected by a wired networking cable. It won’t work if your XBox is just connected by WiFi. If it doesn’t display an IP like 192.168.x.y (it’s something like 0.0.0.0), then plug in your XBox One to the same router as your development PC with Visual Studio. You may also have to restart the XBox One as well after the wired networking has been connected. 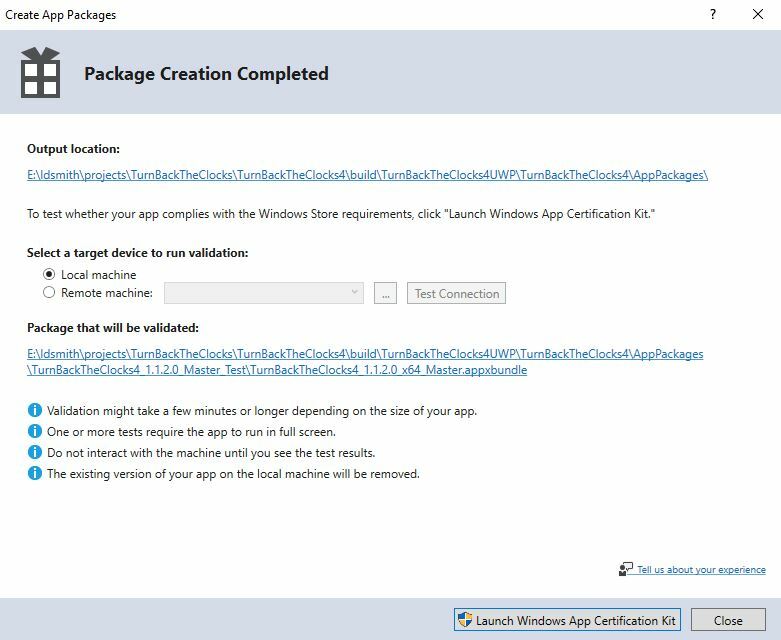 To build an appxupload package to upload to the Windows Developer site, you have to choose Project > Store > Create App Package. It’s really important to note that in the Solution Explorer you must have the line with the name of your project plus (Universal Windows) or below selected. If you have any line above selected (such as Assembly-CSharp) selected, then the Create App Package will be disabled in the menu. I spent quite a bit of time figuring that out. 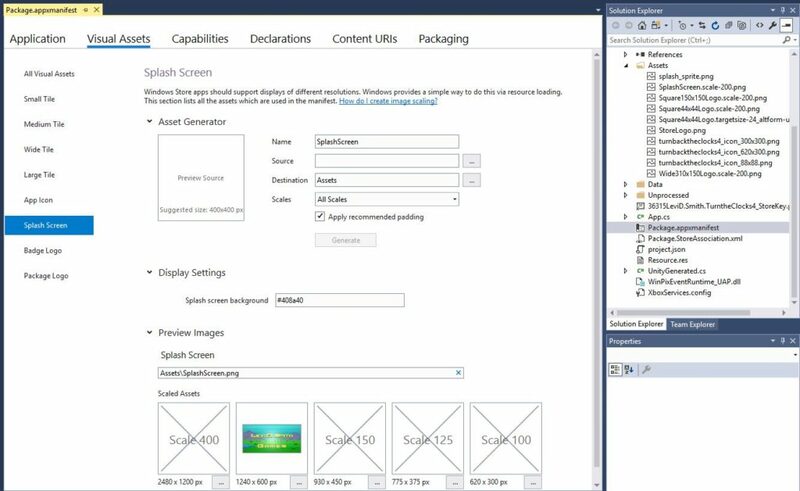 If you want to change the default splash screen (I think it’s a white screen with a gray box and “X” by default), the select the Package.appxmanifest in the Solution Explorer, select the Visual Assets tab, select Splash Screen and set select an image for the 1240×600 px image. You can also set the background color as well under Display Settings. I used Gimp to select the green color from the bottom of my splash screen image, and then selected the color editor to get the hexadecimal value, which I copy and pasted into the Splash screen background field in Visual Studio. You can also set the other images as well, but it is possible to set those on the Windows Developer site before submitting your game for certification. On the Windows Developer site, make sure to go under Services > XBox Live and press the Enable button for the Creator’s program. I actually had a problem with this page going into an infinite load when I used the name “Turn Back the Clocks 4”, however it would work for my other games. Trough trial and error, I narrrowed the problem down to the words “Turn Back”. 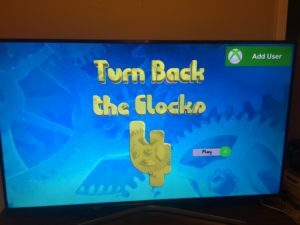 Therefore, I just named my game “Turn the Clocks 4”, and then set the name on the XBox enable screen to the correct name. 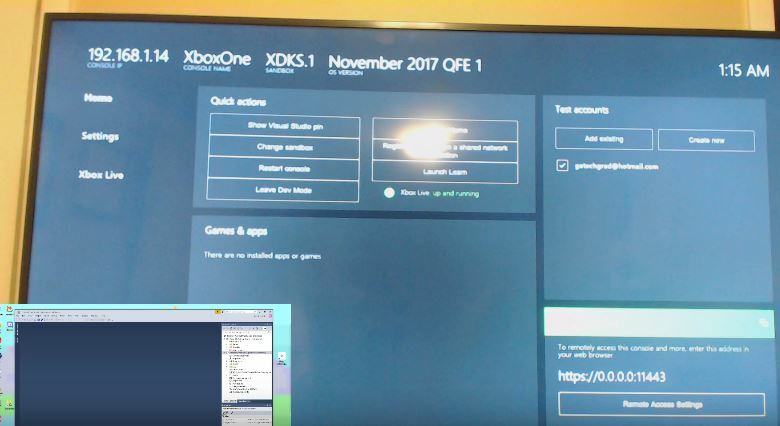 Before submitting the game’s package, it is important to run the Test on the XBox Live screen. Otherwise, you will get an error about a missing XBox Configuration when you try to submit the appxupload package. When deploying to the XBox for the first time, I always seem to get a NullReferenceException on the userID assignment line in LoadProfileInfo. 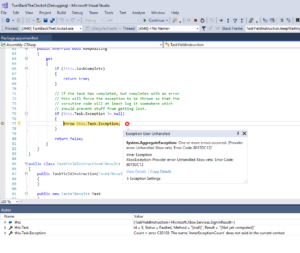 I can press the Continue button in Visual Studio, and it will proceed with no problems. However, it just displays the Add User button on the title screen when the game starts on XBox One. I think this is the same thing that happened with my Kitty’s Adventure game (it was called veto error), and gamertag display works correctly after it is deployed to the marketplace, but it doesn’t work when deployed through on XBox One in Dev mode. Whenever building using the Master configuration or making a Windows Store package, it’s time to go make a sandwich. It takes a really long time. I haven’t timed it yet, but it feels like it takes about ten minutes or longer each time. 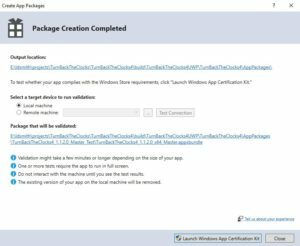 After going through all of the steps, I was able to build the package to upload on the Windows Developer site. It passed the Certification tool as well. However, it must also pass a second certification after it has been loaded to the site, which I think may actually be reviewed by a real person. As I’ve learned with my previous game, it is possible to pass the local certification tool, and then fail the certification after it has been submitted to the Windows Store. I’m now wrapping up the implementation of the gameplay elements in the Turn Back the Clocks 4 game for Dream Build Play. The two features that I had envisioned adding were mines and a slot machine. The mines just act as a hazard, which destroy your ball on contact. Programmatically, this was relatively simple to implement. The mine is just a GameObject with a sphere collider. When a ball collides with it, the ball is destroyed. I do a check in the ball’s on collision method to verify that the object that it has collided with has a Mine component (in other words, has been assigned the Mine script). I have found that this is a better way to determine an object’s type than using the Unity tagging system. I don’t know if there are any performance differences, but tagging seems really redundant when the object already has a type from the script that has been assigned to it. Plus, a GameObject can have multiple scripts assigned, but it can only have one tag. From doing game jams over the five years, I have really learned a lot tricks. Others may call this “tools in my toolbox”. I’ve tried to use an array of the tricks that I’ve learned in this game. One of those is the Blender Cell Fracture add-on. This Blender feature will take an object, and break it into multiple pieces based on the parameters that you set. 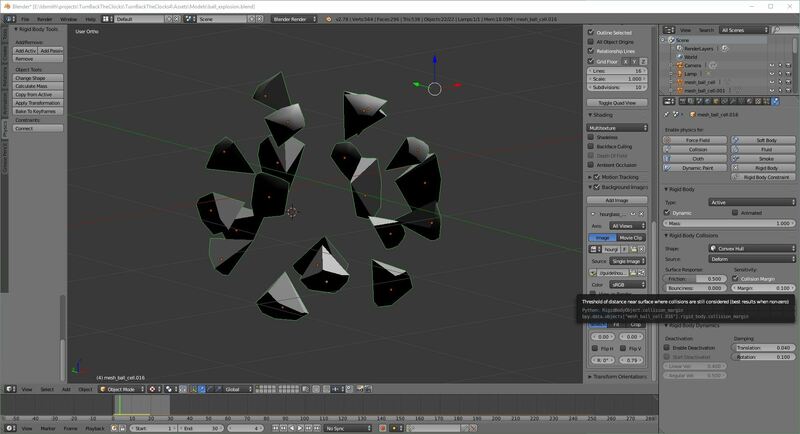 Then you can apply Blender physics to the broken pieces, which will make the object explode over a period of time, which is saved as an animation. So I took my ball model (another good reason to use a modeled ball in Blender instead of the default Unity 3D sphere) and applied the cell fracture. I saved this now model and animation as a ball explosion. This way, when the ball hits the mine, I can destroy the original ball, and instantiate the ball explosion. This makes things a lot simpler, keeping the ball and it’s logic separate from the explosion. The only catch is that you’ve got to pass the ball’s material to the ball explosion, otherwise the explosion will just look like a gray ball breaking apart. I created a method in the ball explosion, which takes the material of the ball as a parameter. The other issue is that the ball explosion actually has two materials that are generated by the Cell Fracture plugin. I know I’ve tried setting the array of materials on an object before, but it never seemed to work. After some research, I found that GetComponent<Renderer>().materials actually returns a copy of the materials on the object. So to assign new materials, you have to set the Material array back to the materials property and it will work. Now when a ball explodes, it is the same color (blue, red, or yellow) of the ball that hit the mine. The other feature that I wanted to have in the game was a slot machine. I got this idea from watching Pachinko videos online. In Pachinko, if a ball goes into the target slot, a slot machine will appear on the video screen. If all three numbers match, then you get more balls. I liked the concept of getting more balls from the slot machine. However, I didn’t like the concept of just matching three numbers. It just felt too random, and the numbers really didn’t have any significance. Therefore, I decided to have the prizes on the slot reel, which were the balls which could be won. Then I had the idea of having a multiplier reel, which increased the number of balls that you would win. The only thing was, I wasn’t sure how this would work with three reels. Finally, I just decided to have only two reels, which made things simpler and much easier to under stand. The first reel is the ball type (blue, red, or yellow) and the second reel is the multipler (x1, x2, or x5). I wanted the better prizes to be more difficult to win, so each reel has five of the low prizes (blue and x1), two of the middle prizes (red and x2), and only one of the best prizes (yellow and x5). That makes eight total items on each reel. The chance of getting the best prize on both reels (yellow ball x5) is 1/8 times 1/8, or a one in sixty-four chance. That seemed about right to me. I wanted the best prize to be rare, but not so rare that it will never occur. I created a SlotMachine script, which controls both of the reels. I decided against have scripts for each specific reel, although that would be helpful if I had a unknown number of reels. The SlotMachine script has float variables which store the rotation of each reel. Each reel is set to a random position, and rotates for a random period of time. It took me a little while to determine which prize was selected when the reel stopped. I converted the rotation to an index by dividing by 45 (360 degrees divided by 8 prizes) and rounding to the nearest integer (modulo 8 to take care of the case when the rotation is greater than 315 and it rounds up). I also have to a 90 to the rotation to get the correct index. This took me a while to track down, and I can only explain it as being an issue when moving from the Z up coordinate system (in Blender) to the Y up coordinate system (in Unity). Frequently, when a Blender model is imported into Unity, -90 degrees on the X rotation is automatically applied in the transformation. However, when you’re handling the rotation yourself, you have to add that 90 degree back to get the correct index. Texture mapping the reels was not too difficult, but I had to make sure that each of the panels in the UV map lined up exactly over the appropriate square in the texture that I created in Gimp. I made the reel texture 2048×2048, and each of the panels are 512×512. I wrote down the sequence of prizes in a text editor, and placed them appropriately on the reel. 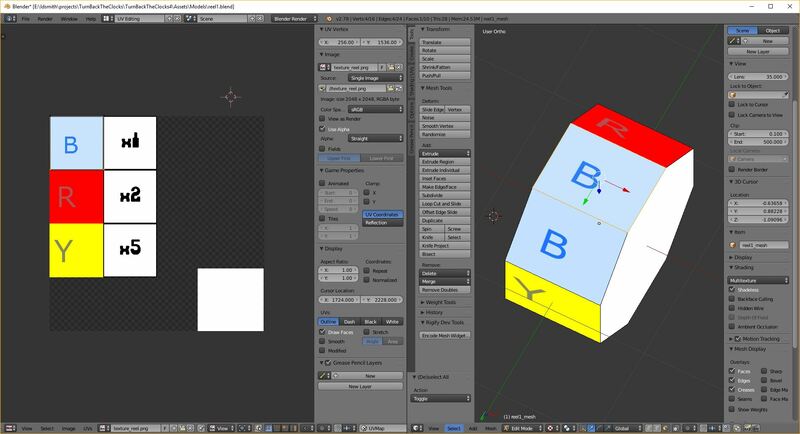 I also created a slot entry object, which is just a simple little container mesh with three sides. The container has a mesh collider on the outside, and a trigger box collider on the inside. If a ball touches the trigger, then a new SlotMachine object is instantiated. After both reels on the slot machine stop, then the appropriate number of balls are added to the player’s ball queue. Another problem arose when a new ball touches the slot trigger, when a SlotMachine is already active, which causes multiple SlotMachines to appear on the screen at the same time. To fix this, I just simply check to see if a SlotMachine already exists using GameObject.FindComponentOfType<SlotMachine>() before creating a new one. This is a little unfair, because the player will lose a ball when they should get another turn at the slot machine, so that is something that could be improved by adding something like a lid on the slot entry that closes when a SlotMachine is active. I think I’ve finished with all of the gameplay elements on this game for now, and I will focus on adding more levels, touching some things up, and make leaderboards work for each level. Also, I’ve got to submit the game to the Windows Store before the end of the calendar year for the Dream Build Play 2017 competition.